Like most big projects we do, we have to put it on the calendar about a month out, giving ourselves time to plan and work up the energy to execute. Then the weekend finally crept up on us! We woke up early, relaxed with a cup of coffee, had a good breakfast, and then got things started! We began by excavating the walkway a few inches deep. We started this on Saturday shoveling all the rocks and gravel out, and giving it a nice straight edge so that Sunday morning we could really get the party started! 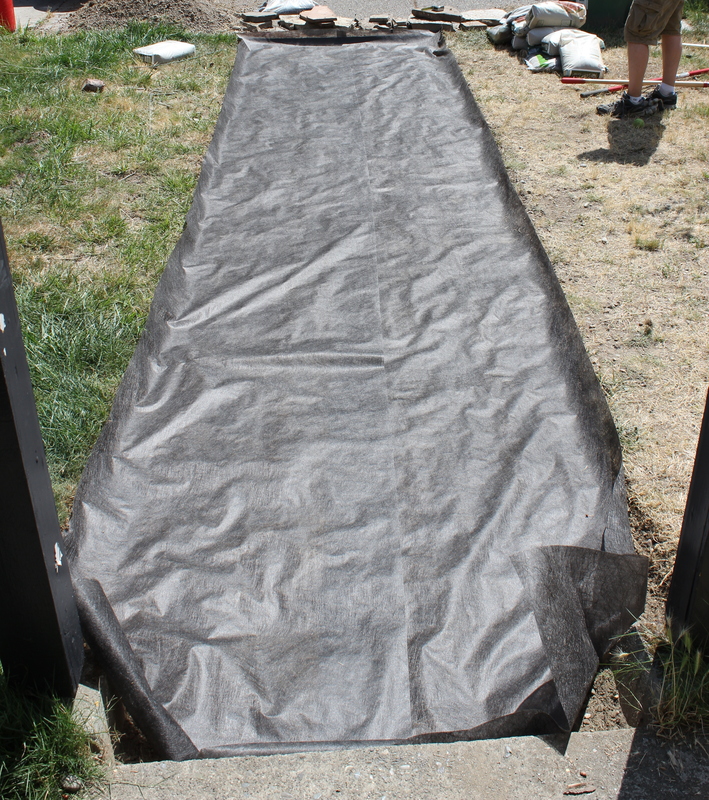 We laid down weed barrier, which was overlapped to keep the weeds from growing up between. 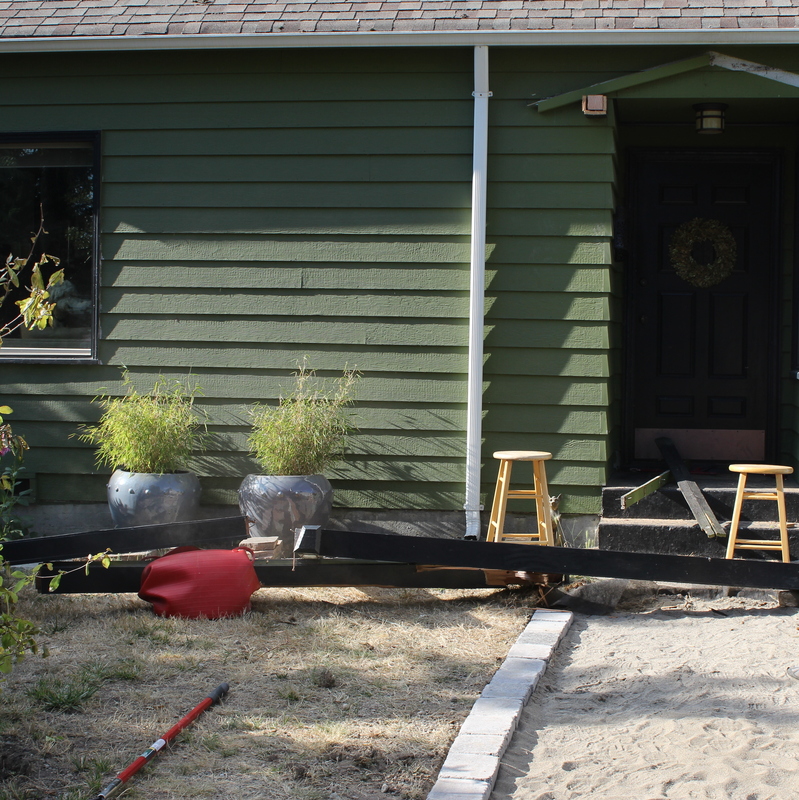 And then we raked out the paver sand to create a flat even foundation in which to lay the stones. We decided to use rectangular 7×9 inch pavers along the edges to give the walkway straight edges and give it a more finished look. 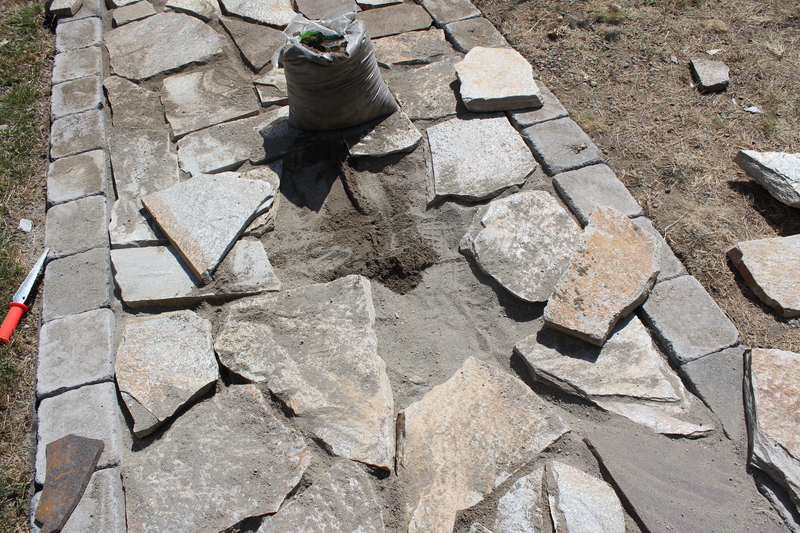 We also did this to help widen the space without having to shell out the money for extra flagstone…they get spendy. The edging pavers ran straight into the bases of the posts holding the weird front porch cover thing (I don’t even know what you’d call it). I thought we could just leave the top portion unfinished until we took the whole thing down, but for some reason, which I am sure he quickly regretted, Jesse said maybe we should just take it down. I have learned that whenever Jesse offers to start a project with/for me…I always say yes! At the start it didn’t seem like the huge detour. The whole thing kind of swayed when you pushed on it, so we thought it would come right down. Turns out while it wasn’t well built, it sure did have a lot of large nails holding it together. After A LOT of trying to pry it apart piece by piece, we gave up and cut the horizontal beams from the house and just pushed it over. Let me back track, we did take off the glass first. This whole time I assumed that they had used plexiglass as the roof cover, but they used real HEAVY breakable glass. Is it just me, or does it seem dangerous to have a glass roof on the porch…I could easily see a kid throwing a ball or a rock and the thing shattering. I guess it was just one more reason to take it down. 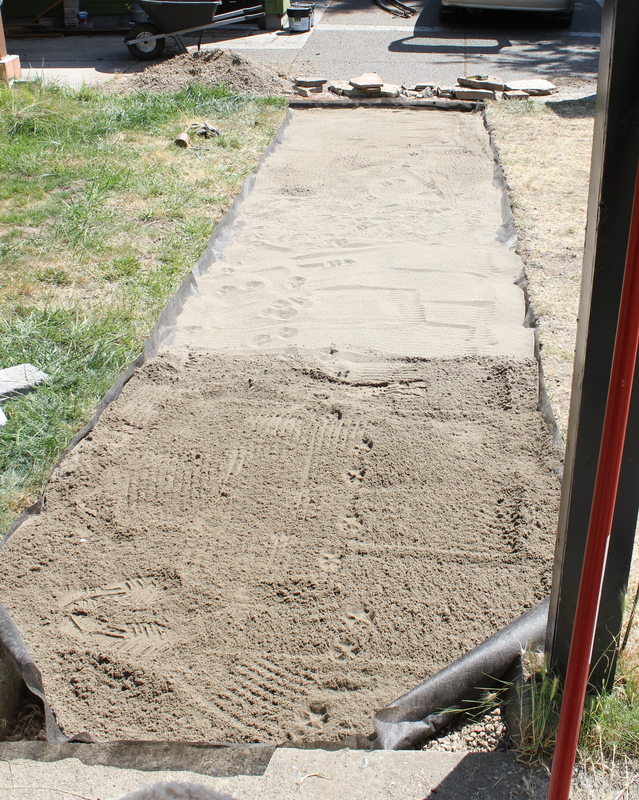 So while Jesse was demolishing the “porch thing” I got started on placing the pavers. 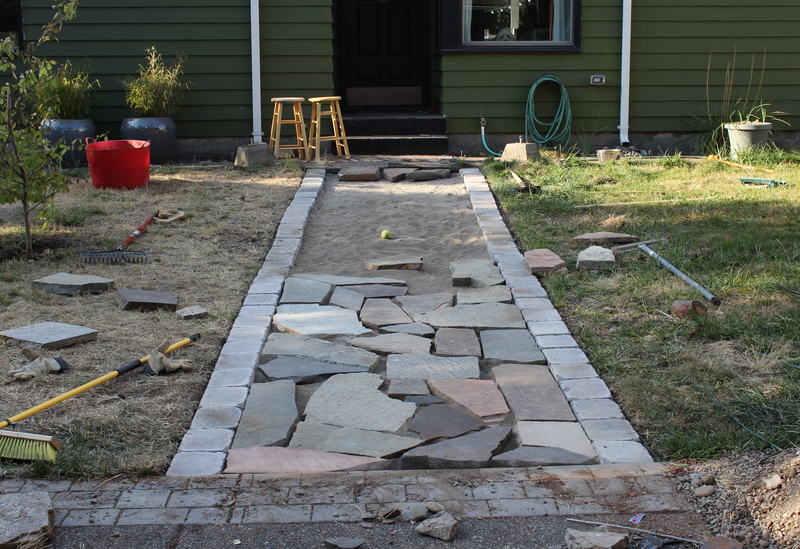 It’s one of those things that is a pain and hard to match up, like a huge puzzle, but then as I got started it went pretty fast…until we ran out of pavers. It was kind of a nice relief because it meant that we were done for the day! 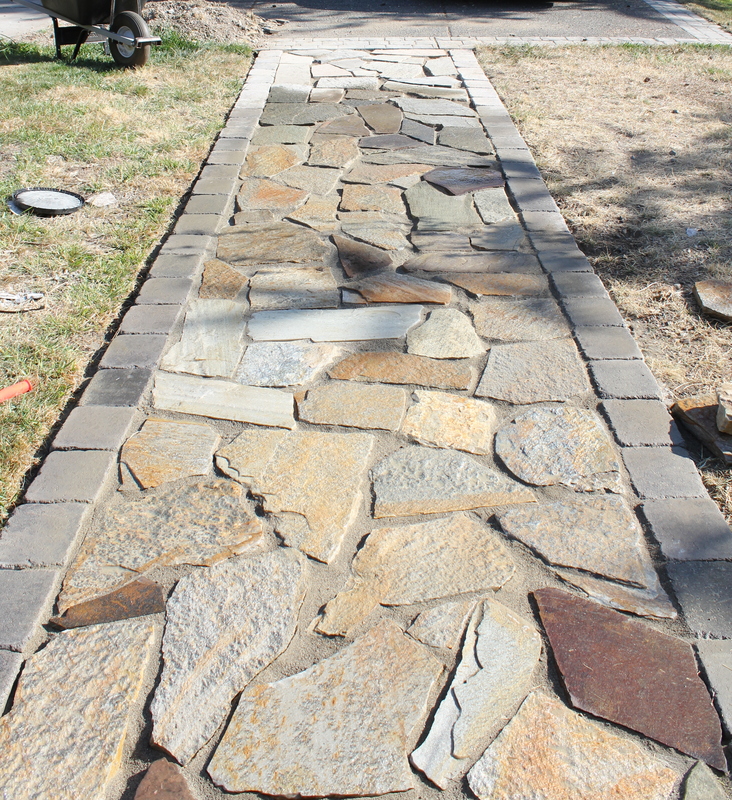 Monday I made another trip to the hardware store and stocked up on more flagstone. This was something that we definitely underestimated. 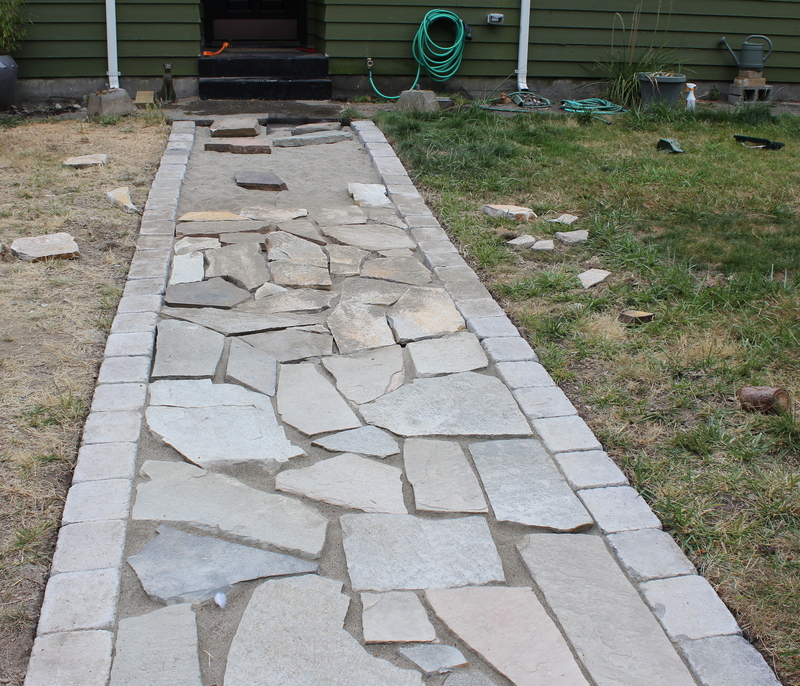 The flagstone from the original walkway ended up only equaling 1/3 of the new walkway. But it was too late to turn back. So I worked some more, went back to the hardware store, purchased more flagstone, and worked some more until I was left with an awkward hole in the middle, at which point I took a long break! But when I came back, I powered through! I completed placing the pavers! Once the pavers were properly positioned and even, I brushed polymeric sand between the pavers. The sand when watered helps to lock the joints and keep the stones in place. This was a tricky step because you aren’t supposed to get sand on the pavers. 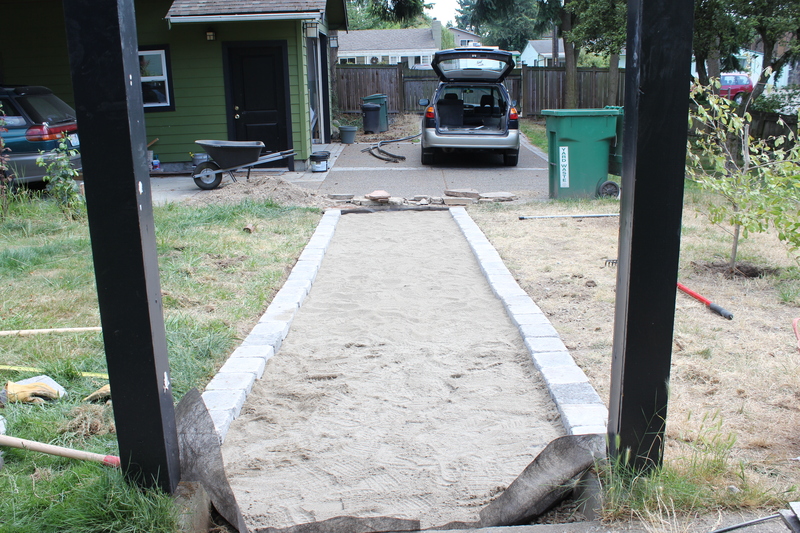 Technically you should use a bag or funnel to just get the sand between pavers. And actually after the fact I found out that you aren’t supposed to use them in joints larger than 1/2 inch. But I swept it carefully and kept it off the stones, and then applied a nice mist of water across the pathway. So I didn’t really follow directions exactly, but I am happy with the result at this point, and hopefully I will be in the future as well. Fingers crossed! And here is where we are as of Tuesday afternoon! 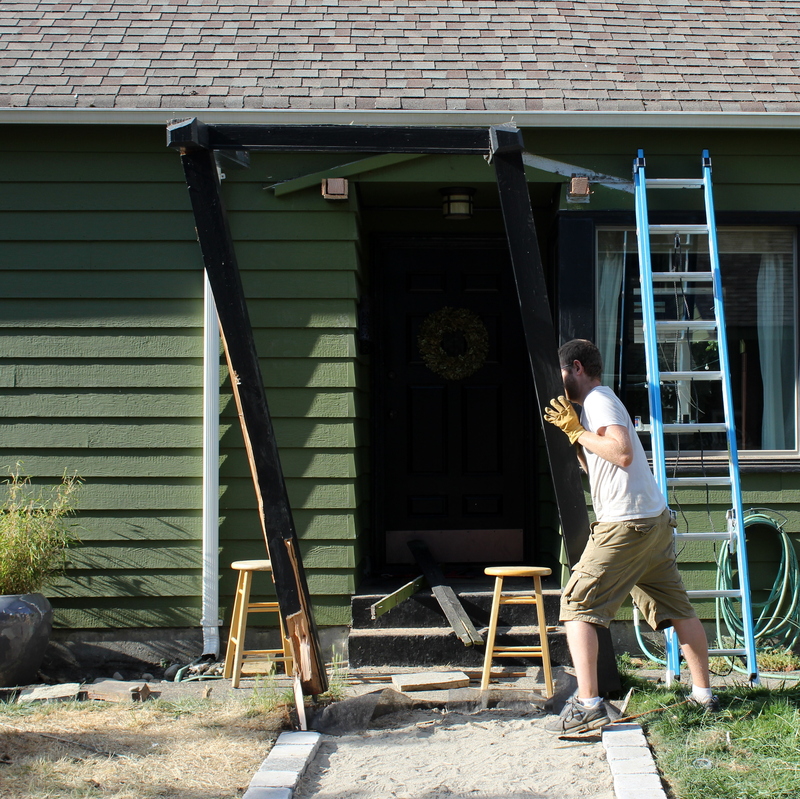 Definitely not an “after” photo…just an “after walkway” photo. We still have plenty of work to do, and I need to clean up the area where we removed the porch. 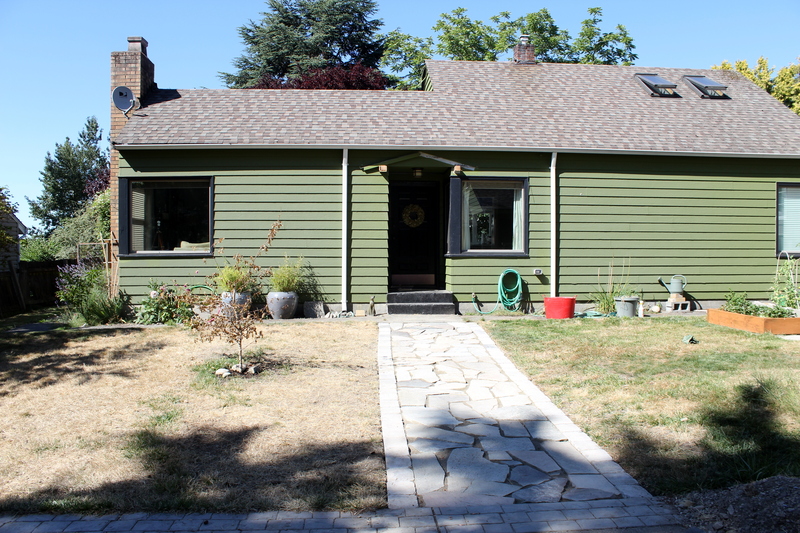 The picture below shows the house with the “porch thing,” without the magnolia tree, and with the old walkway, but I don’t think that it’s a good comparison photo. It’s still summer, the grass looks dead and the poor little tree is in shock. So I think it would be more fair if the true after picture was taken once everything turns green again : ) Or you can just agree that it looks 10 times better! 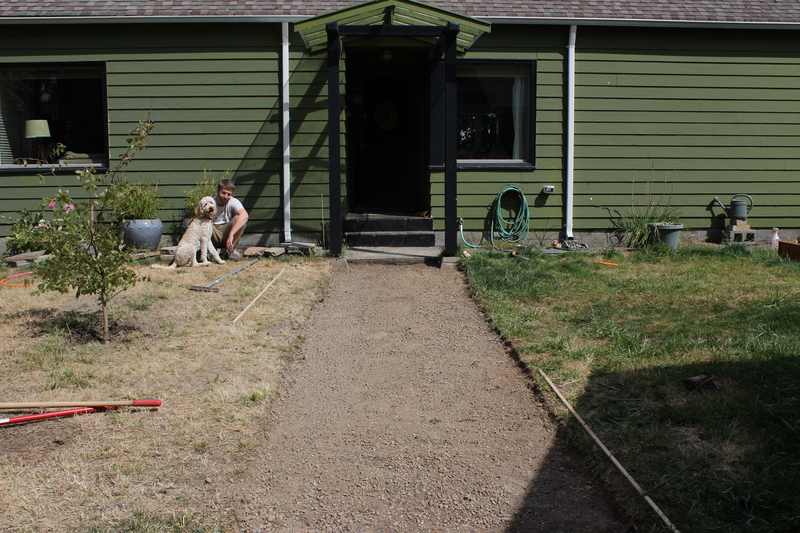 The biggest lesson that I learned and that I will definitely pass on for the REST of my life is…”do NOT use gravel for landscaping.” The original walkway was made of pavers laid on top of gravel, and that gravel over the last 2 years had worked its way into the grass. I spent about an hour raking the grass with my fingers 4 feet on either side of the walkway trying to comb it out. 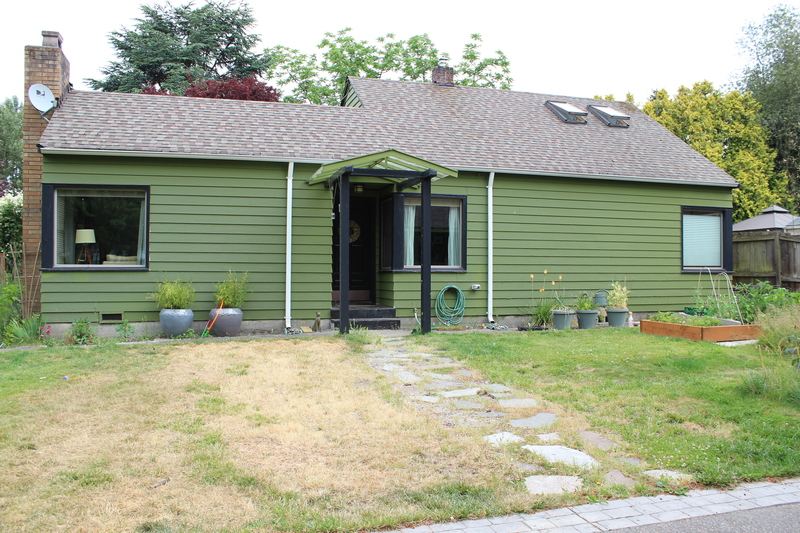 Next on my exterior to do list, I need to fix the spots where the porch cover connected to the house and plant new grass where the grass has died, and this time I vow to water the lawn so it will be pretty enough to go along side new walkway! Looks awesome you guys. I can’t wait to walk on it sometime. you and Jesse never cease to amaze me!